In a recent report, the Qikiqtani Inuit Association says country food harvesting should become a paid profession. Country food harvesting must become a form of paid employment, the Qikiqtani Inuit Association said in a report released at its recent board meeting in Iqaluit. “Our goal is for every Inuk in the Qikiqtani Region to have stable and long-term access to locally harvested country food,” QIA says. QIA’s proposal doesn’t give any dollar figures describing how much they believe hunters should be paid. 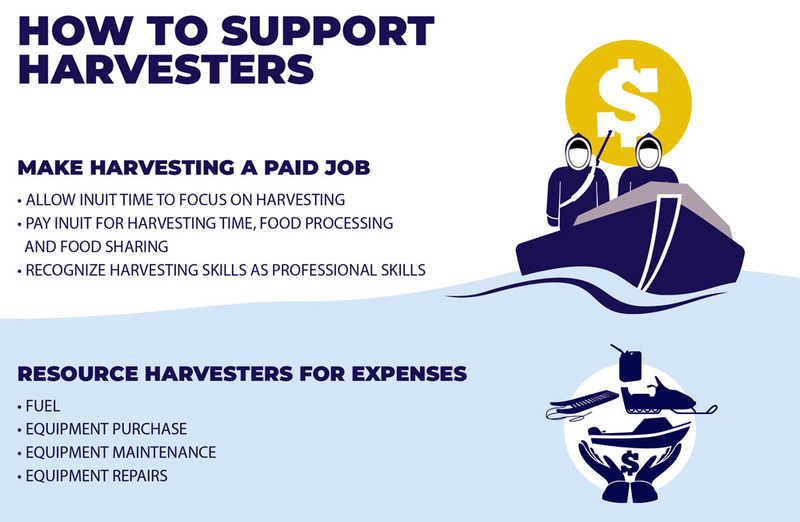 But they say that paying hunters to hunt, as well as paying for hunting-related expenses like fuel and equipment, would give Inuit more time to focus on harvesting and would recognize harvesting skills as professional skills. QIA does not provide any estimates on the additional quantities of country food that would be produced were harvesters paid to hunt. And the report doesn’t say how the proposal would mesh with the Nunavut-wide harvesters support program that Nunavut Tunngavik Inc. administers. 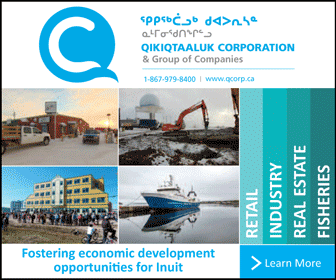 “This means empowering Inuit to feed our own communities,” QIA said. And they refer to oft-repeated statistics that reveal the extent of hunger and malnutrition within Nunavut families. “Current approaches to remedy this crisis, such as providing subsidy on imported foods, are not working,” the report says. That includes the Nutrition North Canada program, which, QIA says, fails to meet its objectives. For example, because Nutrition North does not subsidize hunting, fishing and harvesting equipment, this creates a “systemic barrier” to the cultivation of local food systems. They also complain Nutrition North is “market-driven” and treats food as a commodity rather than a basic human right. And QIA repeats allegations that NTI and Inuit Tapiriit Kanatami have made in the past: that Nutrition North lacks transparency. “Nutrition North does not require that landed freight costs of food and the profit margin collected by retailers be made publicly available, making it impossible to determine if the subsidy is passed on to consumers,” QIA says. Last December, the federal government announced that, through Nutrition North, they’ll spend $62.6 million over five years, starting April 1, 2019, to help country food harvesters. So far, the federal government hasn’t provided any details on how it will distribute that money, and QIA doesn’t discuss the new program in its report. The QIA report on food sovereignty and harvesting is connected to another report that the organization released last week: its submission to the federal government on the development of a new northern policy framework. In it, they propose developing a “conservation economy,” defined as economic wealth derived from local natural resources in line with Inuit Qaujimajatuqangit and local needs. Inuit are adaptive people. But this one touches the very identity of the sharing Inuit. Sharing is a necessity. Putting monetary value on country foods is like a taboo. Instigating bulk sales by individual harvesters rather than putting salaries seem to be more logical. Harvesters should be able to sell their catch without the scrutiny of a taboo. You see the truth of it. Read between the lines here, QIA’s proposal is socialist nonsense… Yay, the people will own the means of production. Hunters paid according to their needs, not some evil “market based” solution. Yes, because you want to consume global market produced goods and commodities like boats, engines, rifles, gasoline, houses (!) and medicine. You don’t want to live without that stuff, and money is the only way to get it. Not to mention, who gets to be the professional hunter? I predict supply far exceeding demand for this job, and nepotism will be how it’s doled out. Boondoggle alert. Don’t get me started on the “conservation economy”! The critique of Nutrition North is valid though. Non-Inuit are okay with factory farmed protein but Inuit aren’t hard-wired to live off them. We Inuit are told those proteins are good for us. But are bodies are hard-wired to live off locally harvested country foods. We see many obese Inuit that live off the Nutrition North “commodities.” Those factories sell by weight so they seem to try and make their farm animals as fat as possible. The fat from the husbandried animals are not healthy as opposed to animal fat from locally harvested animals. Yet Nutrition North and non-Inuit continue to tell us that they’re good for us. Yeah, maybe in a few generations when Inuit bodies have been cultivated for such foods. Just curious but, are you an evolutionary biologist? Because it’s a skill most people don’t really have anymore and it’s very expensive now for people to be able to hunt! It is also an opportunity to solve the food security problem! No one can just become a hunter ! We live in a unique territory and we need unique ways to solve issues such as food security and keep traditional harvesting activities alive!! Your glib talking points don’t really answer Clarity’s question. I have little faith in some GN/QIA/Nutrition North scheme to pay people to hunt. How much money are we talking here? How much are they going to harvest? Who do they give it to? Who’s going to oversee it… honour system? To be honest though, it would be interesting to see how this plays out purely from an anthropological perspective. I mean it will fail, almost certainly, and for predictable human reasons. But it won’t fail in exactly the same way collectivist farms in Soviet Russia or Mao’s China failed. As Aingilliq Tukummiq says, we live in a unique territory. How bout QIA just pay for this out of some IIBA money they have lying around? 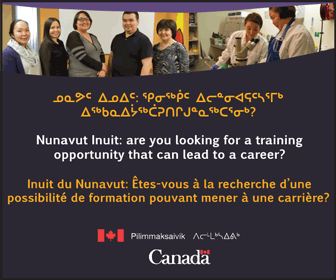 We have had 20 years of Nunavut, being the jurisdiction containing the largest fully practicing bunch of “hunter gatherers” in the country. Yet here we are, with an Inuit Org finally coming out with the basic idea that should have been the center piece of government policy from the start. It is not at all fair that the Federal Nutrition North be singled out for missing the mark on creating livelihoods for hunters. The GN continually runs school traditional activities, community hunts, tourism initiatives, search and rescue operations, wildlife monitoring projects, TK studies, and such that have skirted this main issue. All of these things have depended on having functioning, fully equipped, intensive hunters. The GN has relied on hunters to make all these things possible, but other than starting to tan and sell seal-skins, has done next to nothing to keep their profession going. Cuts to Community Harvester Assistance, cuts to Outpost Camp funding – really when you think of it, a complete disgrace. All done by MLAs we elected. Wow: I have read so much about the knowledge elders have and share with young. One of things that I took away from the Elders. Was how sharing is so important. When you start paying for country food that is wrong. Goes against all those great things that Inuit have claimed that they value so dearly about their culture. The basic premise of QIA’s statement is erroneous. Rather than taking the flawed stance that hunting for wild food is a right, KIA need reevaluate its motive, at which time it will conclude that hunting for wild food is a responsibility – those that can, do. There are many who can – can afford, have the skill, have the access. We have the responsibility. Following the error in the basic premise, KIA is offside many other statements. For example, there are many contributors to food insecurity and ill health in NU but “southern protein” is not one of them. Nor is the availability of country food or access to hunting. When KIA’s members are ready to be honest with their motives we can have a discussion. Further, it is also a responsibility to care for children and those who are unable to fend for themselves. This is where we have arrived in our society. Perhaps there is another alternative. There has been talk in the south about a coming need for a “guaranteed annual income” as robots replace people in many jobs. Maybe Nunavut should be the first to really try it. Instead of paying hunters for their catch, I suggest that the government pay hunters to be hunters. The pay has to be enough that they have enough money to cover the cost of being a hunter and also enough money to comfortably support the needs of a family. Then the hunters would be able to continue to share their catch, as has always been the tradition. I think it would be a big mistake to think a guaranteed annual income will be worth any more than welfare. Ontario tried it, and complained it was too expensive and it was $2000/month for a married couple. FYI: Can’t rent a tiny apartment in Ontario for less than $1000/month. Hi Dave, I live in a small town in SW Ontario with a low cost of living. One-bedroom apartments cost about $650/month here. My three-bedroom one-bathroom house was purchased for $100,000. $2000/month would have worked out well here. Doug Ford, our Premier, has cancelled the program. In principle this is a potentially useful idea. I can certainly see this working with seal meat or the huge populations of game birds like geese in some areas. Unfortunately, this report is extremely weak. Next time, QIA should hire a professional to do a proper proposal that government will take seriously, with real details and proposed dollar figures. Please provide answers to basic questions like how much money, who will write the cheques, who will decide who is a “hunter,” and what is the dollar value of country food. Other parts of this report are ridiculous. I burst out laughing when I read the line that says “undue pressure to conform to the global market economy.” Please stop spouting garbage like that. This is a good idea, but next time please hire an adult to do the report for you. I think this is a great idea but it’s weak proposal that the government will look into. This could be very much what the Inuit need for Nutrition North instead of the North Mart being paid to lower their prices. 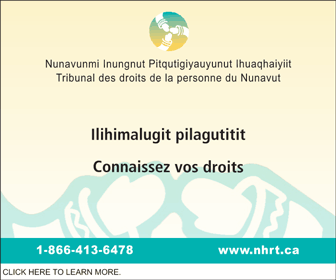 The GN or Inuit Org. should be hiring Hunters and Interns to do the harvesting and where would the meat be spread out to. There are still people who can teach the Interns on how to cut an animal, there are names in Inutitut for the materials that they use and how detailed the harvested skill are. This is a strong subject to the hunters and it already shows in these 8 principles of Inuit Qauyimayatuqangit/Inuit Societal Value that the Interns can learn from. Keep this going for our people, this is our hope right now. Peace. This isn’t a new idea. Back in the early days of the GN a very detailed proposal was developed to “professionalize” a number of experienced hunters in each community. The proposal was shot down because it was deemed to be too expensive to operationalize and maintain.